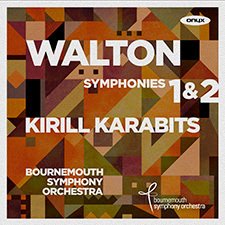 Walton’s First Symphony burst onto the musical scene in 1935, and quickly became recognised as a masterpiece. Influences of Sibelius and Beethoven can clearly be heard, but it is Walton’s brilliant use of the orchestra and grasp of form that shines through – a remarkable achievement for a composer of 33 years. The second symphony has never had an easy time, in both escaping the shadow of its older sibling, and in overcoming the hostility of the late 1950s and early 60s when avant-garde was in, and this symphony was viewed as out of date. Fortunately it is now recognised as a masterpiece to rank alongside No.1. It is assured, mature and confident, subtle and refined – a composer at the top of his game.